A couple of Sundays ago (October 25 to be precise) I invited our friends Rosemary and Jean-Michel to take the trip down from their home in Blois to visit us. It enabled me to unload a couple of dozen apples on them, along with some saffron bulbs and some garlic. Plus it meant we could pop over to Maison Perrin and order our fresh foie gras, to be picked up in early December and processed by us ready for Christmas, at a workshop held at Rosemary and Jean-Michel's, like we did last year. Jean-Michel being tutored by Paul in sniffing out the characteristic odour of the False Death Cap mushroom. Just as importantly it allowed me to take Rosemary and Jean-Michel on a mycologie outing in the Forest of Loches. 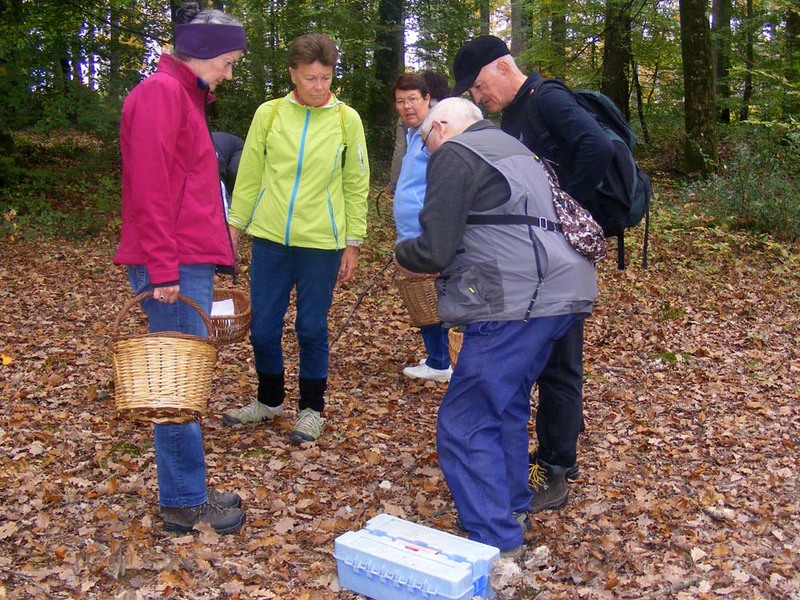 Rosemary and Jean-Michel are keen mushroom foragers for the table and are already very knowledgeable but had never been on a science focused fungi foray before. 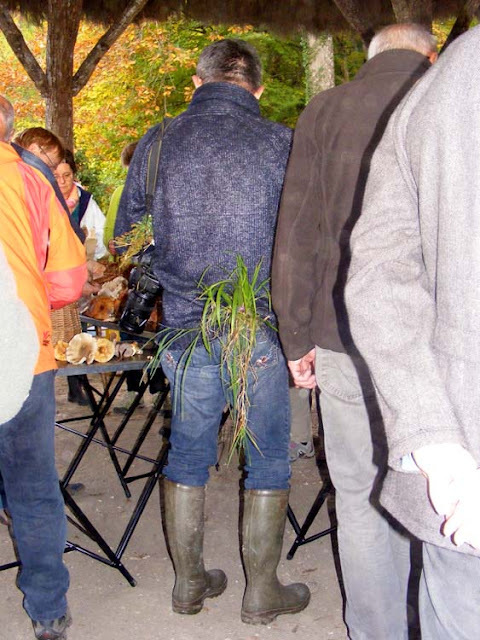 Jean-Michel was particularly looking forward to meeting my fellow members in the Association de botanique et de mycologie de Sainte Maure de Touraine, who were leading the outing. I made sure we hooked up with Paul, one of the real experts and Jean-Michel had lots of questions. 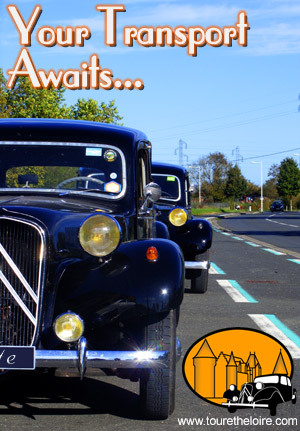 Paul loves to pass on his knowledge and all sorts of snippets of information were exchanged. I lurked around in the background and took photos and notes. The False Death Cap Amanita citrina (Fr. La citrine) for example has a strong and characteristic odour of raw potato and radish. Ironically, the False Death Cap isn't toxic, but isn't especially tasty, whilst its lethal lookalike the Death Cap Amanita phalloides, smells sweet and tastes pleasant. The latter is so poisonous that even the spores dropped accidentally on edible mushrooms can lead to symptoms of poisoning that if not treated can result in liver damage. 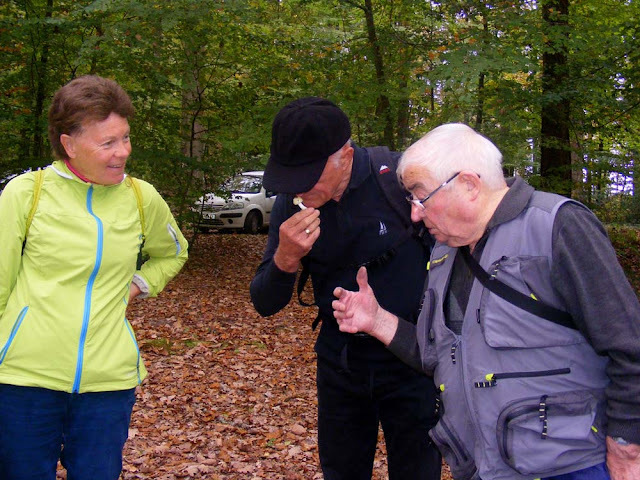 Rosemary on the left and Jean-Michel on the right take in every word as Paul explains how to identify a particular mushroom. 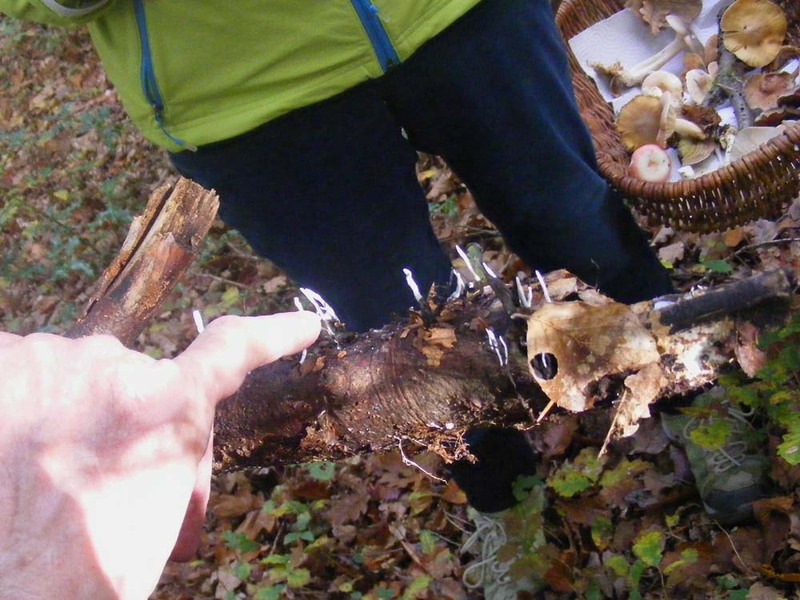 Paul showing me some Candlesnuff Fungus Xylaria hypoxylon (Fr. Xylaire du bois), still white and immature. Inside a ripe black Candlesnuff are the spores. 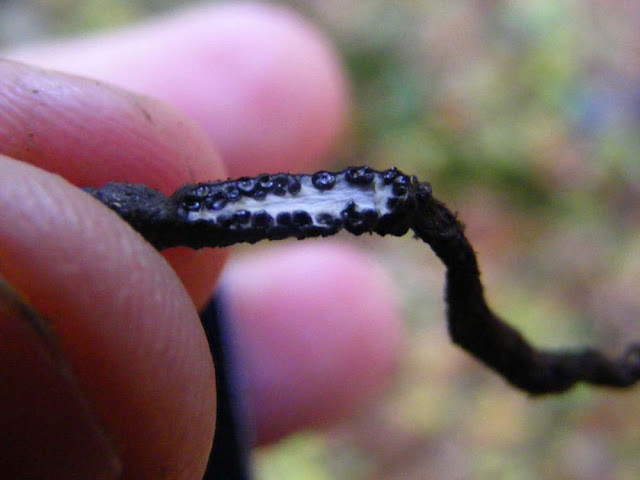 Paul deftly cut this tiny fungus the diameter of a piece of string to reveal the surprising structure . Candlesnuff fungus has quite complicated life cycle. If you are interested in the details, see here. Not everyone was focusing on fungi. François was collecting botanical specimens, in his typical chaotic but brilliant manner. but I'd hate to see his washing machine filter!! Yes, I assume the information about the taste comes from the dying. It's always expressed as 'reported as' tasting pleasant. Paul loves these really small fungi that you have to examine under magnification. He's a proper published expert on certain families. You should see the back seat of Francois' car -- basically covered in what looks like hay, but is actually grass specimens he's collecting and isn't allowed to bring into the house! He's wearing rubber boots in the picture, but I have known him come on outings wearing cowboy boots or winkle pickers.